We also run a tour of the stunning island of Delos - click here for more info. St. John Villas and Spa is a top class hotel resort for those looking for that little bit extra during their holidays. Located in the area of Agios Ioannis and spanning a total area of 20,000 sq.m, this beautiful hotel has been designed to offer guests the most memorable stay possible. Enjoy exquisite sunset views over the Aegean Sea and relax and total luxury as the professional, courteous and friendly hotel staff tend to your every need. Some excellent facilities available to guests at the Saint John Villas and Spa include; 200-meter long private beach, a spa, a tennis court, swimming pools, restaurants, bars, conference halls and outdoor reception areas. The stunning brand new 5 star Mykonos Riviera is located in Tourlos port and marina. With an ultra chic style, magnificent panoramic sunset views and luxurious accommodation options this is the perfect option when in Mykonos. Amenities including an exceptional spa, 2 restaurants, and infinity pool with fantastic lighting in the evening. The property is a few minutes from Agios Stefanos beach, and a short stroll from the scenic Mykonos Town. The spacious rooms and suites is fitted with open plan bathrooms, designer bathtubs, nautical-themed decoration, flat-screen TVs, Nespresso machines, ambiance lighting, and private terraces with unobstructed views overlooking the Aegean sea and the port with its marina. Room options or suites also feature an outdoor hot tub or a private pool. A buffet breakfast is available each morning at the property..
Myconian Imperial Hotel & Thalasso Spa a five star Mykonos luxury hotel situated in the serene Elia Beach of Mykonos. 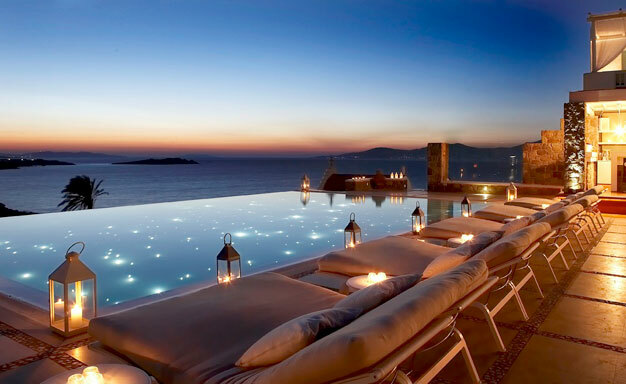 An exclusive luxury hotel in a sacred, authentic, Cycladic environment blended with the cosmopolitan aura of Mykonos. Along with the other Mykonos luxury hotels of the Myconian Collection Hotels Group, the Myconian Imperial Hotel is a true pearl of the Aegean. Top choice destination for VIPs, jet-setters, artists and all kinds of discerning travelers Myconian Imperial Resort has set the standards of Mykonos luxury hotels exceptionally high.From up-scale conferences and memorable weddings, to romantic escapes in our Superior Mykonos Rooms with private pool, all woven with a Cycladic culinary art and the touch of Venus in our Thalasso Spa Center. Located on Agios Ioannis Beach, Mykonos Grand Hotel & Resort provides 5-star, boutique accommodation set amidst cobbled paths overlooking Delos Island. It includes a health centre and offers fine dining in stylish settings. Free Wi-Fi is offered throughout the property for guest to use. Rooms and suites combine the cube-shaped Cycladic architecture with the restful interior décor and all open out to balconies or patios with sea, garden or pool views. Guests can enjoy fresh seafood, grilled specialities and other Mediterranean flavours either at the open-air dining room or by the pool offering panoramic sea views. The White Bar is ideal for a glass of champagne in a minimalist setting featuring an outdoor terrace. Althea Spa Centre offers a wide variety of natural treatments based on traditional Greek techniques. Guests can spend relaxing moments by the pool featuring private areas, while a state-of-the-art gym and a tennis court are also available. Think gorgeous sunsets, extravagant cocktails by the infinity pool, intimate and stylish suites with breathtaking sea views, lazy days of sunshine and you are picturing Bill & Coo Suites and Lounge. An undeniably romantic boutique hotel set high above Megali Ammos beach, just a short walk from Mykonos Town. All 23 suites at Bill & Coo Suites & Lounge are chic, cool and minimalist, designed in shades of white with touches of colour to provide a romantic ambience. After a relaxing day of sea and sun, return to your room to prepare for dinner. Spare a few minutes to sit with your partner on the terrace and watch a sensational orange sunset dip behind the horizon. Wander down to Bill & Coo’s lounge bar by the illuminated pool and order an aperitif before sitting down to a delicious dinner. The Palladium Hotel Mykonos, is a supremely elegant, 5 star boutique hotel with an outstanding reputation for its excellent service and immaculate accommodation. Occupying a prime setting on a gentle hill above the beaches at Psarrou and Platy Gialos (about a 3 minute walk away), the 5-Star Palladium is a very special 'boutique hotel' where elegance perfectly combines with top-quality service. The sea views from the pool terrace are spectacular, be it by day or night, and the interior design shows immense style, care and attention to detail. Platys Gialos Beach is popular for its water sports facilities, while at Psarou Beach, visitors to Mykonos can expect to rub shoulders with one of the many celebrities or royalty who are attracted by the jet-set lifestyle in this area. 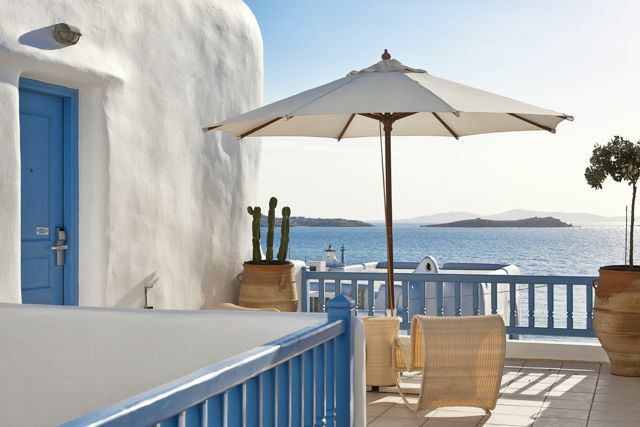 The hotel exudes the cosmopolitan character and charm of Mykonos, while offering travelers a haven of tranquil delight. Mykonos Ammos Hotel is the ideal destination for the ones seeking an ultimate experience that combines luxurious accommodation, culinary suggestions in the restaurants Kuzina Mykonos and Farina and endless fun in the vibrant and elegant beach of Mykonos, Ornos Beach. This 50 room boutique hotel, situated on the beach, blends magically the crystal waters, the white sand and the unparalleled Mediterranean blue sky and offers you a new experience you will never forget. Mykonos Ammos Hotel provides you with high standard facilities and services that guarantee a memorable stay in Mykonos. Take a swim at both hotel pools, visit the Wellness & Beauty Center enjoy the beauty treatments at the hands of the experts and rejuvenate. Featuring an infinity pool with sea and sunset views and al fresco dining, Vencia Boutique offers elegant accommodation with balconies in the cosmopolitan Agios Eleftherios in Mykonos (10 minute walk from MykonosTown). Karavaki Lounge Bar Restaurant is open throughout the day as guests can enjoy a breakfast with spectacular views, and continue until late in the evening choosing from a variety of Mediterranean dishes and drinks. Free Wi-Fi is available in the rooms and in the property's public areas. Petasos Beach stands on a private peninsula between Platis Yialos and Psarou Beach. It offers a 500 square-metre spa & wellness centre, a fitness centre and 2-level swimming pool with waterfall.The Aqua Marine Spa offers revitalising and thalasso-therapy treatments, as well as honeymoon packages. The magnificently renovated Petasos Beach combines aesthetically perfect premises with breathtaking nature. Its innovative designed rooms offer stunning views of the Aegean Sea. All accommodations are equipped with Wi-Fi internet access. Deluxe and superior rooms also feature a spa bath and steam cabin. Guests can enjoy cocktail drinks in the pool restaurant or use the recreational facilities of the hotel. Mykonos Palace Beach Hotel sits impressively on the golden sanded beach of Platis Gialos. It offers a pool with a sun terrace and bar, as well as a seafront restaurant. 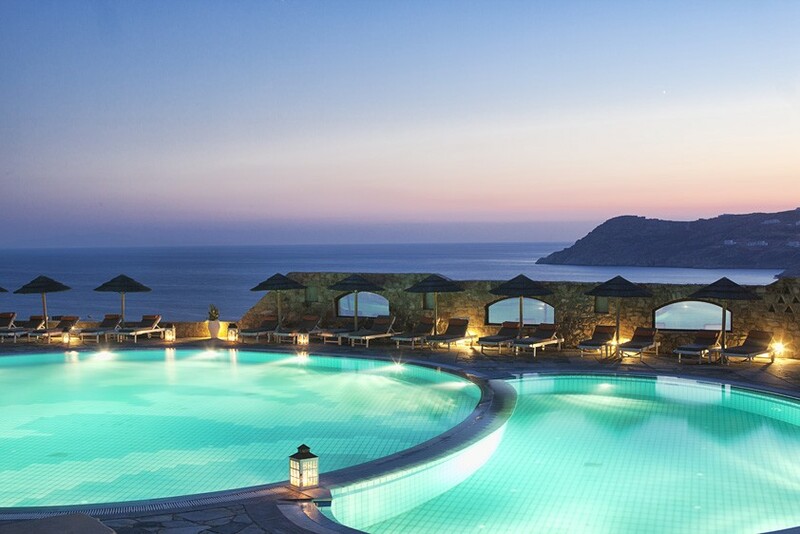 It has an immense view of the emerald crystal waters of the breathtaking Aegean Sea. Consisting of several Cycladic style whitewashed buildings with painted window shutters, Mykonos Palace Beach Hotel emulates a pure feeling of relaxed living on the islandof Mykonos. Mykonos Palace beach hotel is the ideal option for guests who seek for luxury beach hotels in Mykonos. Built and decorated in full, Mykonian architectural style, Mykonos Palace Beach Hotel is a beautiful, comfortable hotel , settled in a privileged location, right in the center of Platis Gialos Beach. Located next to the old port of Mykonos and in the heart of its shopping and nightlife district, this boutique hotel offers stylish accommodation with stunning sea views. It features a Spa Centre with sauna and a fully-equipped fitness centre. Each of Harmony’s private balconies offers views to Mykonos Town and the Aegean Sea and a perfect place to witness the beautiful sunset. Each room features double-glazed windows and scales. Elegant and charming, offering traditional Mykonian architecture, hospitality, and style. Enjoy the trendy lounge bar where you can relish fabulous views and music while enjoying a favorite cold drink. The unique design and atmosphere of the pool allows guests to enjoy a leisurely swim or lounge by the poolside while listening to music, viewing the magnificent sea, and having access to drinks from the pool bar. Superb Greek cuisine awaits you at the Apolafsis gourmet restaurant, where you can consume delicious meals while appreciating romantic views over the water. Free Wi-Fi and room service is also available. Aphrodite Beach Hotel & Resort is situated next to the picturesque Kalafatis beach. It features a swimming pool, tennis court and 2 restaurants. Wellness facilities include a fitness centre and 2 hot tubs. The Aphrodite Beach Hotel offers stylish rooms with a balcony that overlooks the Aegean Sea. The resort offers a number of activities, such as volleyball, windsurfing and scuba diving. Lively Mykonos Town is just a 15-minute drive. The Myconian K Hotels (Kohili, Korali, Kyma and Kalypso) offer affordable luxury Mykonos accommodation in the heart of Mykonos Town. Set in an ideal position, just a short walk fromMykonos town Myconian K Hotels & Thalasso Spa Center offer affordable luxury Mykonos accommodation beyond compare. Carefully selected Mediterranean cuisine, multilevel swimming pools, magnificent views and Thalasso Centre; the ideal place to achieve total rejuvenation of body, mind and soul. A serene environment which promises a unique, unforgettable and discrete experience, undoubtedly making it in one of the best Mykonos Spa hotel. The Vienoula's Garden Hotel in Mykonos Town is built according to the traditional architectural style of the island, in shades of white and blue and offers you the advantage of staying in a peaceful environment, close to the hustle and bustle of Mykonos Town and a short distance from Ornos Beach and Platis Gialos Beach. It features a wonderful pool and the location that makes one of the most preferable hotels in Mykonos Town. Kamari Hotel is located just a few steps from the beach of Platys Gialos. The nearby Psarou Beach and Paradise Beach offer other vibrant beach options for guests. Enjoy an outdoor pool, a spa tub, and a children's pool. Other amenities include complimentary breakfast, a bar/lounge, and a poolside bar. All rooms are tastefully designed and come with balconies. Situated in the 'heart' of&amp;nbsp;Mykonos, at Mykonos Town, New Aeolos Hotel offers great accommodation combined with the town’s vibrant lifestyle. Superb facilities such as the large pool, the Wi-Fi Internet access (throughout the hotel) and the pool restaurant are some of the benefits you will receive by staying at New Aeolos Hotel. Sweeping views of the endless azure Aegean Sea can be enjoyed either from your room's balcony or by the pool. These views can be the highlight of your stay! New Aeolos Hotel could be a peerless hotel experience during your stay in one of world's most reputable destinations, Mykonos. With magnificent views over the sea and the famous windmills of Mykonos Town, Ilio Maris boasts elegant guestrooms with Wi-Fi and have spacious balconies or terraces, most with sea views. Guests can take a dip at the Ilio Maris swimming pool and enjoy the lovely sunset view over the Aegean Sea. Ilio Maris is located on the border ofMykonos Town, close to the taxi and bus terminals, allowing easy access to the cosmopolitan town, as well as to the beautiful sandy beaches Paradise, Paranga, Psarou and Platis Yialos.